Abe Cohen Plumbing and Heating is who you need to call for circulation pumps for building heating in Ahuntsic, Baie D'Urfe, Beaconsfield, Bord du Lac, Cote Saint-Luc, Cote St-Luc, Dollard des Ormeaux, Dorval, Downtown, Hampstead, Ile Bizard, Lachine, Lacey Green, Lakeshore, LaSalle, Laval, Mile End, Montreal West, NDG, Nouveaux St. Laurent, Nun's Island, Old Montreal, Outremont, Pierrefonds, Plateau, Pointe Claire, Pointe St. Charles, Roxboro, Ste-Genevieve, St. Henri, Town of Mount Royal, Verdun, Ville St. Laurent, West Island, Westpark, Westmount. Your hot-water heating system uses a circulating pump to move the heated water throughout the closed circuit of the building's radiators (convectors), and then back into the boiler. Failure of the circulation pump requires immediate attention—modern heating boilers can be damaged by lack of circulation. Passive or gravity feed circulation (even in a boiler designed for gravity circulation) is inefficient and inadequate to deliver enough heat for comfort, especially during the coldest winter months. If your boiler is working and there is "some" heat, the problem may be the circulating pump. If your circulation pump is making a loud or unusual noise, this is an indicator of failure or impending failure. Call us for inspection, repair, and replacement if required. We install, maintain, repair, and replace all brands of circulator pumps for hot-water heating systems, regardless of fuel type (natural gas, electricity, bi-energy, oil, other). At Abe Cohen Plumbing and Heating Inc., we are a three-generation family business with more than 50 years in the plumbing trade. We consider our customers to be family and friends in a long-term relationship with us. 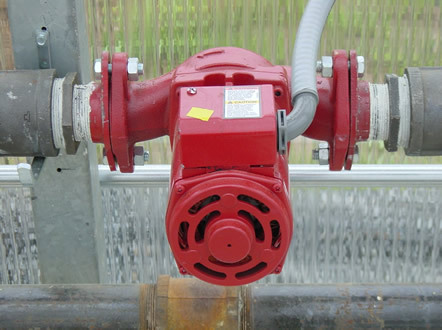 We have the experience, expertise, tools, and equipment to repair or replace circulation pumps in industrial buildings in the greater Montreal area. We are respectful, clean, and professional. We are certified and active members of CMMTQ (Corporation des maîtres mécaniciens en tuyauterie du Québec), ACQ (Association de la Construction du Québec), and certified partners of Gaz Métro for natural gas piping and installations.